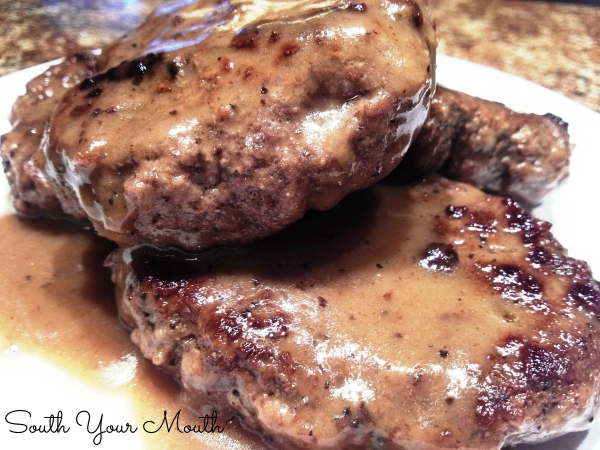 The BEST recipe for Hamburger Steaks with easy, homemade brown gravy. Can you think of many things that are better than brown gravy? I would, honest to God, choose a plate of rice and gravy with a side of black-eyed peas and fresh sliced tomatoes and cucumbers over filet mignon. I’m not even kidding. And, ummm... I'm not trying to brag or anything but if there's ONE thing I'm great at, it's making gravy. If they had a cooking competition for gravy, I could win that sucker blind-folded and drunk with one hand tied behind my back. Making biscuits? Negative. Cooking a steak to the perfect temperature without cutting it to peak inside? Not a chance. Decorating beautiful cakes with hand-piped icing? No way. But making gravy? Oh yeah, that's my jam. You can make brown gravy from just about any kind of meat that’s cooked to yield pan drippings. I guess that’s why we just call it “brown” gravy because you can’t really pigeonhole it into just beef, pork or chicken gravy. Sometimes I add onions to this but the white onions I had on-hand were wicked strong and I didn't want to overpower the taste of the gravy. If you want to add onions, just slice a medium onion into rings and add to the pan while you’re searing your hamburger steaks. If you love gravy, double the recipe below. I always eyeball my roux when making gravy like this. I add enough flour to the pan drippings to make it about the consistency of ketchup, cook the four until light brown then add broth or water, while constantly whisking, until it's the thickness that I'm after. Southern Style Potato Salad - Classic potato salad with boiled eggs, mayo, a dab of relish and a touch of mustard. Slow Cooker Pinto Beans - Tender, saucy, slow cooked pinto beans perfect with a little diced onion on top. Green Beans & Potatoes - Southern style slow cooked green beans cooked with bacon, onions and potatoes. Southern Style Mac & Cheese - Custard style baked macaroni and cheese with eggs and evaporated milk. Black-Eyed Peas - Slow cooked black-eyed peas cooked with ham or bacon until saucy and tender. Fried Cabbage - Chopped fresh cabbage sauteed in bacon grease seasoned with simple salt and pepper. Crumble ground beef in a medium bowl and add salt, pepper, onion powder and garlic powder; mix by hand until seasoning is evenly distributed taking care not to over-work the meat. Shape ground beef into four thin hamburger steaks (about 1/2 inch thick). Heat vegetable oil in a frying pan over medium-high heat. Once the pan is good and hot, cook steaks on each side for 4-5 minutes or until nicely seared. Remove steaks to a plate and set aside (do not worry if they are cooked through, they will finish cooking in the gravy). Reduce frying pan temperature to medium. Pour off pan drippings into a cup or bowl, measure 1/4 cup of the drippings then add back to the pan (the hamburgers should yield almost exactly 1/4 cup of pan drippings but if you’re short, add vegetable oil or butter). Add flour to pan then whisk to incorporate. Continue cooking and whisking for about 3-5 minutes or until roux is medium brown. Add beef stock and continue whisking for 2-3 minutes or until gravy starts to thicken a little (gravy will be thin). Add salt and pepper to taste. Add hamburger steaks to gravy, reduce heat to medium-low then continue cooking, uncovered, for 15-20 minutes or until meat juices run clear and gravy has reduced and thickened. Serve with white rice or mashed potatoes. Add mashed potatoes and veggies...mmmm! Congrats on having the recipe with the most clicks from last week's Weekend Potluck. These look seriously yummy! My beef loving family will be very pleased when we have these. Looking forward to seeing what you bring this week. Thanks so much for being so faithful to our little party! Hi Mandy! These hamburger steaks look delicious! I too, am a Southern girl who loves to cook! I don't usually create recipes, just follow others, such as this. Nice to meet you! Blessings from Bama! This reminds me of my mum making "salisbury steak" with cube steaks: saute in butter, make a packet of dry gravy mix, and serve with instant mashed potatoes and veg. She was an extraordinary lady though after moving to NY from London she embraced mod cons as did many ladies in the early 60's. Sunday dinners were always a joint of the day: standing rib roast with yorkshire pudding, crown roast of pork, leg of lamb, whole turkey, and the like which provided many leftovers with few poor iterations. Don't remember much ground meat though we did have cube steaks now and then. These DO look good, and the homemade gravy perhaps augmented with mushrooms and herbs will definitely be on the horizon. Hubby likes any kind of meat, and this would go together quickly. 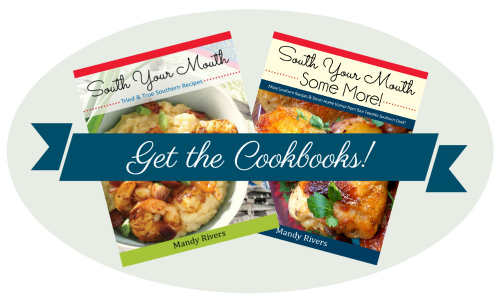 Love this country cook weekend potluck as I discover new to me blogs such as yours. Off to subscribe and get more of your lovely recipes. Wow, bring back memories! I grew up eating Hamburger Steaks and this looks delicious. These are wonderful. I make them with 1lb of good beef combined with 1lb of jimmy dean's original sausage, 1 tsp of seasoned salt (lawry's). They are amazing with mashed potatoes, steamed veggies and king's sweet rolls. This was so good, and easy! Love your blog, you are hilarious! Made this the other night, the only thing I did different to the gravy was add about teaspoon of Kitchen Bouquet and about 4 oz of sliced mushrooms. Good stuff. Thanks. Kitchen Bouquet makes the gravy or au jus taste amazing! ah my Gawd! i frickin' love hamburger steaks, and people never know what they are! i love mine with A1 or another comparitable (word?) steak sauce. I made this the other night for my family and my grown daughter who was over visiting (she lives 5 houses from me) and they were a huge hit. EVERYONE and I mean EVERYONE, even the picky grandson who is not a gravy fan LOVED these. a few nights later my daughter cooked them for her husband and he is now in love with this recipe. Good thing too, cause I think if my daughter had it her way, they would eat them 4+ nights a week. haha. Just made this tonight after seeing it on Pinterest. AMAZING. It will now be a staple in my house. Thanks!! I make this and use ground deer meat in place of the beef and it is awesome! It is one of my husband's favorite meals. I add mushrooms to it when I have them available and it makes it even better. Made this tonight, and it was marvelous! I used such lean ground beef that it didn't leave any fat, so I used bacon grease and it gave such a great taste to the gravy. This definitely goes on the 'make-again' list. These were an almost weekly staple in our house about 40 years ago when the food budget was really tight. Sometimes I added crushed crackers to make it go a little farther. Love these! Made these tonight with ground venison. The venison is really lean so I used a bit of bacon drippings in the pan. My husband raved about them. Thanks for sharing this recipe! I stumbled on your site when looking for a good hamburger steak recipe. So many of your recipes look so good, I can't wait to try some more. Dont have a url, but my name is Sharon. Like I said, the recipe was awesome with venison. I am going to try your meatball recipe with venison too. Made this tonight but with chicken tenders and chicken broth. My first gravy! Everyone loved it. Thanks!! This was super easy! Husband loved it! Sounds awesome, I will have to cook this for my family. I love Hamburger Steaks. I eat Hamburger Steaks at least every other week at New Orleans Bar and Grill restaurant in Greensboro.. its so delicious. My family just finished these up for dinner and they were soooo good!! I didn't have onion powder so skipped it and didn't have beef stock so I used vegetable broth and it was awesome!! For the side I sliced potatoes and zucchini really thin, seasoned them with salt, pepper & garlic powder and butter and baked them in a casserole dish. We poured some of the gravy over the veggies too. These babies are always superb! Made some last week with added shroomers, what a feast! Thanks for sharing a great recipe, Mandy. Do you know what "shroomer" means? You enjoy your far out acid trip, hippy? This is one of my ALL TIME FAVORITES from childhood. My dad made these all the time with corn and rice he microwaved (yes, I know I never could duplicate his technique and he is the only person I know who can microwave regular rice and it come out perfectly fluffy and cooked through). I still make this often for my family and have mixed it up different ways using ground beef, turkey or chicken. I like to add different herbs to the meat to change up the flavor also. My fav is rosemary. It brings such a nice element to the meat. Thank you for posting this so that the love of savory goodness this dish inspires can be shared! A Mouth-Watering, MY kind of meal. Yes and yes please! Thanks so much for sharing at Weekend Potluck. Your recipe looks delicious! I pinned to save. I challenge anyone to say this isn't some of the finest eating a person can experience! Shirley. I don't normally leave comments for recipes. But, I had a taste today for hamburger steaks, and remembered your picture on Pinterest. So, I whipped up a batch. OMG! I Love the gravy! Spices absolutely perfect! I'll be using your recipe from now on! BTW,,,,,lots of people are using your photo to carry you to the wrong sites. Just wanted you aware. I'm making this tonight for my boyfriend and his brother. I don't have onion powder. Could I finely chop onion and throw it in the beef? Yes and it'll be 10X better! I made them and they were a HIT! It was also my first time making gravy, and it was so simple! My boyfriend has asked that I make this meal again.... and often! I've been looking through your recipes and discovered we cook a lot alike. I don't know, maybe we southern girls are just born to cook good food. Just a suggestion on your hamburger steaks, try breading them with flour. They are awesome that way. Also I use Wyler's beef granules to sometimes flavor my gravies if I'm making beef tips or hamburger steak. It's a good replacement for beef stock. Finally I have found a cooking website to my taste. Thanks for sharing! I saw this recipe on your Facebook page awhile ago & finally made it tonight for dinner. Can I just say I was blown away how delicious this was?! My husband is still raving about it & said I can make this as much as I want!! Thank you for yet another 'keeper' recipe!! Yours are THE best. Always Love this recipe… Everyone in the family enjoys it every time! If I have pre-sliced patties, can I just sprinkle on the seasonings or do I need to work them through all the meat combined? I finally got around to making these, and they are delicious!!!! Gravy scares me, but this turned out perfectly! Made this tonight. So good!! 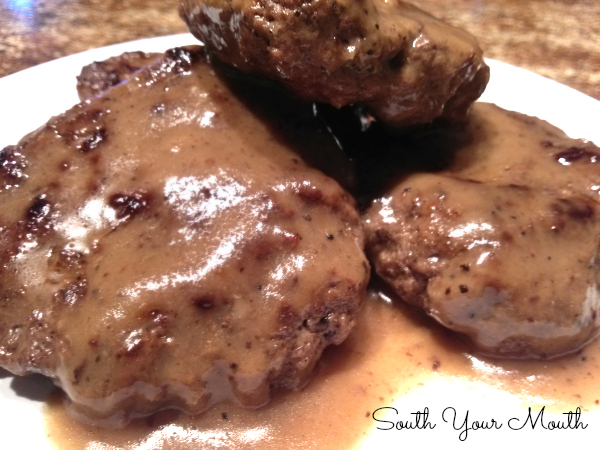 My hubby too will take this over a filet mignon and I have often made "a hamburger steak, store bought gravy. This will definitely becomes one of our go too's. So easy and usually have all ingredients on hand. Just made this and we loved it. Husband commented several times at how good it was. It was also easy too, and I mixed the meat by hand on the tray the meat comes in so I didn't have to dirty a bowl. Add chopped onions to the ground beef. Flour and brown in a small amount of fat until almost cooked. Remove from pan and add 2 Tablespoons flour to fat in pan. Brown slightly and add 2 cups milk and cook until thickened. A can of cream of mushroom soup can be added to make more gravy. Thin with milk if needed. Add hamburgers and simmer carefully for about fifteen minutes. Serve with mashed potatoes, peas and hot dinner rolls. A lighter dessert is usually wise as this is rather filling. This is the Northerner version popular here in Wyoming. I have a recipe for hamburger steaks and gravy, but I'm gonna use yours tonight. My recipe includes eggs and bread crumbs but I won't be using them. Will post my results ASAP! Well, I made your recipe and it was DELICIOUS! This is the first time I didn't use seasoning salt, eggs, and breadcrumbs. And it was a hit. I had to triple the gravy and double the seasonings because I used 2 lbs. of ground beef. Your recipe shall now be my go-to recipe for hamburger steaks. Oh yeah, and I didn't need to add any additional seasonings to the gravy. The beef broth was enough and the gravy was WONDERFUL!! MY FIRST TIME MAKING MY OWN GRAVY AND THIS RECIPE HELPED ME NAIL IT! IT WAS GREAT!!THANKS!! What I really like about this is that the flavor is not overpowering and the gravy does not have that artificial flavor that gravy mixes normally have. The flavors balance out without one being dominate. Thank you! We Like them very much and I am passing on the recipe!! I like this! But I roll my hamburger in flour , then fried it up, remove and make milk gravy , and pan bread. If you don't mind. You're first recupe for the gravy, was it one or 2 cups of beef broth & how much flour? I don't rememberit being in ounces & i'm kind of weird about being very precise about something when I like it lol. Wanted to like this but the ratios of the patties and gravy seemed all wrong. 1/4 pound patties? With that much cooking time they shrink to the size of a hockey puck. The gravy was thin and had to be thickened with corn starch.